A full marathon through the streets of Birmingham is set to become a major international event in the running calendar - and create huge economic returns for the city. The 26.2-mile world-class event - to be called Birmingham International Marathon - is expected to bring a major marketing boost to the city with extra tourists and business investment. It will be staged for the first time in October next year and place the city in the same league as the likes of London, Paris, Berlin and Rome. The event, which has been revealed today, will be organised by The Great Birmingham Run Company in partnership with the city council and is set to become the leading autumn marathon in the UK. Organisers also hope it will be used for the 2018 Commonwealth Games trials. The start line will be at the Alexander Stadium, the home of British Athletics and Birchfield Harriers. Runners will pass landmarks including Villa Park, Selfridges, Cannon Hill Park, Cadbury&apos;s and Edgbaston Cricket Ground. The Great Birmingham Run Company is staging the Great Birmingham 10k this Sunday and the Great Birmingham Run half marathon on October 16 this year. The company also manages the world&apos;s biggest half marathon, the Great North Run, as well as the Great Manchester Run and the Great South Run. The marathon will be held at the same time as the 2017 half marathon with the routes for the two races overlapping at different points but they will have different start lines. 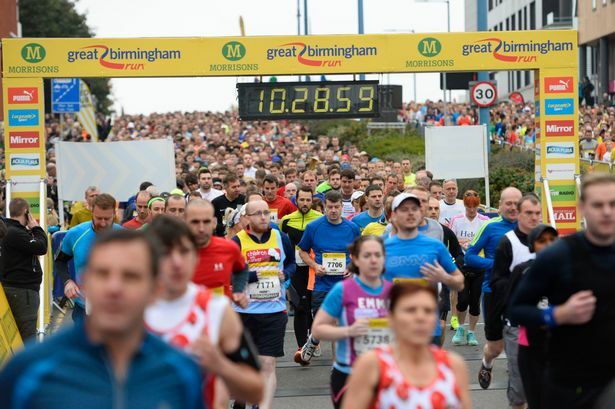 The Birmingham International Marathon will be the inaugural run in a newly formed Great Run British Marathon Series, managed by The Great Run Company, which is set to create two more marathons in the UK. Birmingham City Council announced a bid for Birmingham to become the European Capital of Running with a pledge to get 5,000 couch potatoes pounding the streets to get fit in April 2015. Sport England awarded the council and its partners (The Great Run Company, Sport England and England Athletics) £1.5 million lottery cash for a programme to get 100,000 people inspired to start running by 2018. Steve Hollingworth, Birmingham City Council assistant director for sport and events, said: "We are delighted the Great Run Company has chosen Birmingham to stage an international marathon. "It will encourage more residents to become physically active and have access to a full complement of running events in the city. "A marathon will also bring additional economic value, will raise the city&apos;s profile and reinforce our ambition to be the European Capital of Running." The UK is known to lack world-class marathons. Yet, interest in distance running is now huge with the internationally renowned London Marathon being seven times over-subscribed every year. Britain was the dominant force in marathon running in the 1960s but standards have been largely slipping since then, with just five male athletes breaking the two hour 20 minutes barrier in 2007, and only eight dipping under two hours 30. It is hoped the new Birmingham International Marathon will help raise these standards. Research carried out by The Great Run Company from a survey of more than 10,000 people found that 73 per cent of current Great Run participants would be interested in running a marathon in the Midlands. Mark Hollinshead, Great Run Company chief executive, said: "Birmingham is long established as a centre of running in the United Kingdom with its huge network of club runners, the British Athletics Inter Counties Cross Country Championships and the success of our own Great Birmingham 10k and Great Birmingham Run. "The Birmingham International Marathon will become a huge celebration of running for all, offering an ideal opportunity to improve the strength and depth of British marathon running. "As with all the world-class events we deliver, not only will this be a great event for British elite runners, we will also aim to attract runners of all abilities from the UK and beyond, to run for charity, for the challenge or just for fun. "This will be a celebration of all that&apos;s great about Birmingham." * Entries for the Birmingham International Marathon will open in autumn 2016. Runners can sign up for a reminder to enter at www.greatrun.org/reminderservice.